Movement studies of Great Lakes fishes were a featured topic at the 4th International Conference on Fish Telemetry in Cairns, Australia, this past summer. The conference included presentations by researchers tracking marine and freshwater fishes worldwide using a variety of telemetry technologies. The conference brought together 148 delegates from 17 countries, and of the 100 total presentations given, 14 were on studies of Great Lakes fishes. Acoustic telemetry research in the Great Lakes is facilitated by the Great Lakes Acoustic Telemetry Observation System (GLATOS), a network of researchers who work collaboratively using acoustic telemetry to understand fish behavior, movement, and dynamics. 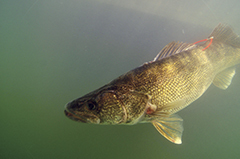 Presentations by GLATOS-affiliated scientists focused on the movement and behaviors of important species in the Great Lakes including lake trout, walleye, lake sturgeon, cisco, bass, bowfin, sunfish, and the invasive sea lamprey. 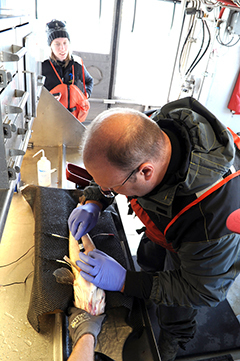 Acoustic telemetry is an important research tool in the Great Lakes because of the method can provide detailed data about when and where a fish was located, as well as opportunities for researchers to collaborate on projects. Using acoustic telemetry, researchers can track the movements of fish with remarkable precision. This detailed information allows scientists to discover previously unknown aspects of the lives of fishes in the Great Lakes, such as where certain fish spawn (a difficult job given the vastness of the Great Lakes), when fish move to and from spawning or overwintering areas, and how much mixing occurs among fish stocks. 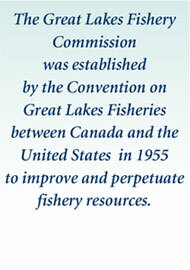 Ultimately, this information is highly valuable for improving Great Lakes fishery management. 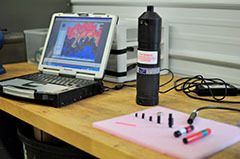 The GLATOS network consists of 207 researchers engaged in 58 projects, almost 8 thousand fish carrying acoustic telemetry tags that continuously emit a unique ID number, and more than a thousand underwater receivers anchored to the lakebed throughout the basin. For every occasion a tagged fish swims past a receiver, the unique ID is recorded. In a little over five years, GLATOS researchers have already recorded more than 240 million movement records for more than 39 species of fish! With very careful and detailed analyses, and with help from the centralized GLATOS database, researchers can piece together the records from the network of receivers throughout the Great Lakes to learn more about fish migration patterns, habitat use, and survival. Fishery managers now have new information to make sound decisions about the $7 billion Great Lakes fishery! Participation at events like the International Conference on Fish Telemetry can significantly enhance the caliber and outcome of research projects, as well as improve the research process. Researchers have opportunities to: meet other scientists face-to-face who are studying related research questions in other areas of the world; obtain immediate feedback on their ideas and research progress; and, learn new information about study species, data-gathering techniques, and various analytical methods and equipment. Enhancing the ability of scientists to share resources—including equipment, data, ideas, and expertise—is invaluable and critical to advance research in any area of study. One outcome for the GLATOS researchers attending this year’s International Conference on Fish Telemetry was progress toward development of a statistical software package to analyze acoustic telemetry data. Currently, there is no consistent analytical method being utilized by telemetry researchers, though many scientists have developed parts of the process. By meeting with telemetry experts at the conference, GLATOS researchers—in collaboration with colleagues from Australia, South Africa, Europe, and Canada—are leading the way toward development of a single statistical package that will be freely available worldwide for telemetry experts to use. The package will contain pre-written and vetted statistical code that other researchers can readily apply to complete their own analyses, without having to independently develop the code from scratch. The next International Conference on Fish Telemetry meeting will be held in Norway during 2019. During the next two years Great Lakes telemetry researchers will be hard at work generating new scientific findings and solving the mysteries of fish movement in the Great Lakes. Each yellow dot depicts the location of a receiver—a small, data-logging computer—which is anchored near the bottom of the lake bed along migration routes, near spawning areas, and other places of interest to scientists. A searchable version of this map is available on the GLATOS website.